In 1928, a few years before J.R.R. Tolkien wrote The Hobbit, he was asked to aid in researching a curious Roman temple. Archaeologist Sir Robert Eric Mortimer Wheeler and his archaeologist partner and wife Tessa Verney Wheeler (a pioneer in the field and a quietly fierce badass who deserves far more attention than she’s gotten, see this article by Lydia Carr, biographer and author of Tessa Verney Wheeler: Women and Archaeology Before World War Two) were excavating the Roman remains at Lydney Park in Uley, Gloucestershire, including a late 4th century temple which inscriptions identify as dedicated to the god Nodens. This was a mysterious, rarely seen deity, his ethnic heritage unclear, his possible purview ranging from the sea to hunting to healing. 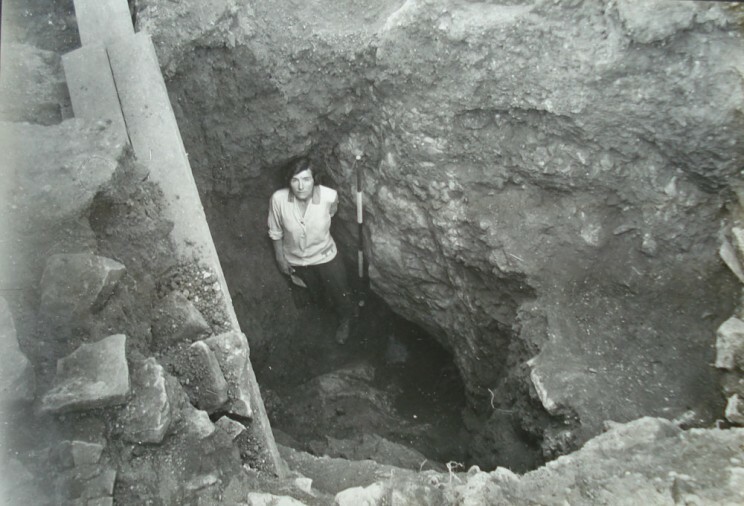 Tolkien’s conclusions, written up in the essay The Name ‘Nodens’, were included as Appendix I to Sir Mortimer Wheeler and Tessa Verney Wheeler’s Report on the Excavation of the Prehistoric, Roman, and Post-Roman Site in Lydney Park, Gloucestershire, published in July, 1932. By the end of that year, Tolkien had finished writing The Hobbit. But why, you understandably ask, is his research into the name of an obscure Celtic deity relevant to his penning the works that would grant him literary and cinematic immortality? Well, one reason is that the site itself bears some relevance to the world Tolkien would soon create. A Roman mine with intact shafts was found underneath the hill with small hobbit-like holes leading into the mine. A group of small axes were discovered inside the mine’s trap door. After the Romans abandoned the site, the locals began to find it creepy. They thought it was haunted, the dwelling place of goblins and dwarves. The Anglo-Saxons named it Dwarf’s Hill. According to Lydney Park curators, Tolkien expressed open interest in the folk tales and history of Dwarf’s Hill. Then there is the ring. 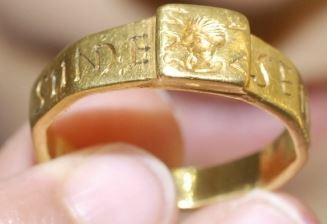 The large inscribed gold ring. The large inscribed cursed gold ring. You see, 100 miles away from Lydney Park and 140 years or so before the Wheeler’s excavation began, a farmer ploughing a field outside the Roman city of Silchester turned up a gold ring. It was a ring like no other, 12 grams in weight, too large for anybody but a Dark Lord to wear normally and thus probably worn by puny human hands on a begloved thumb. It dates to the 4th or 5th century. The ring is a faceted hoop with 10 squares, the center top square engraved with a distinctly unattractive, spiky-haired, huge-nosed, wonky-eyed profile of Venus. We know it’s Venus because her name is engraved next to her. The remaining facets are engraved with Latin letters like so: SE | NI | CIA | NE | VI | VA | S | II | NDE. The phrase is commonly interpreted as a cropped and misspelled statement of piety: “Senicianus vivas in Deo” (“Senicianus lives in God”), but that’s problematic because it suggests a Christian monotheism out of place on a ring starring Fright-Wig Venus. It’s possible that the phrase was engraved first and then Venus engraved on top, cutting off the end of the word “deo” or “deus.” One early 19th century antiquarian suggested it should be read as “Senicia ne vivas in indecentia,” (“Senicia doesn’t live in indecency”) and the Venus head as that of Venus Urania, the goddess of pure and chaste love. In 1805, 30 years after the farmer ploughed up the ring, the Bathhurst family of Lydney Park had their garden excavated for the first time. This was when the temple was first discovered. It was this dig that unearthed a lead curse tablet with a remarkable link to the Silchester ring. 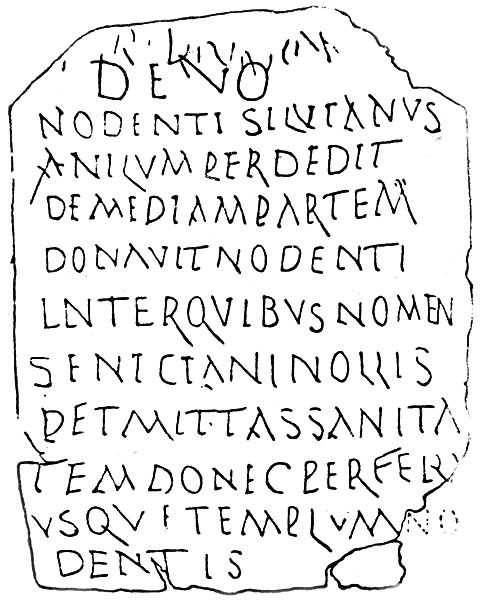 Found in a storage room attached to the main hall along with requests that Nodens heal their illnesses, this lead tablet invoked Nodens’ power over health to inflict sickness on a certain Senicianus if he does not return a ring lost by one Silvanius to the temple: “Divo Nodenti Silvianus annulum perdidit dimidiam partem donavit Nodenti. Inter quibus nomen Seneciani nullis permittas sanitatem donec perferant usque templum Nodentis.” (“To the God Nodens, Silvanius has lost a ring. He has given half of it [its value] to Nodens. Among those whose name is Senicianus, do not permit health until he brings it to the temple of Nodens.”) The word “redivivia” was added to the tablet after the initial inscription to renew the curse. 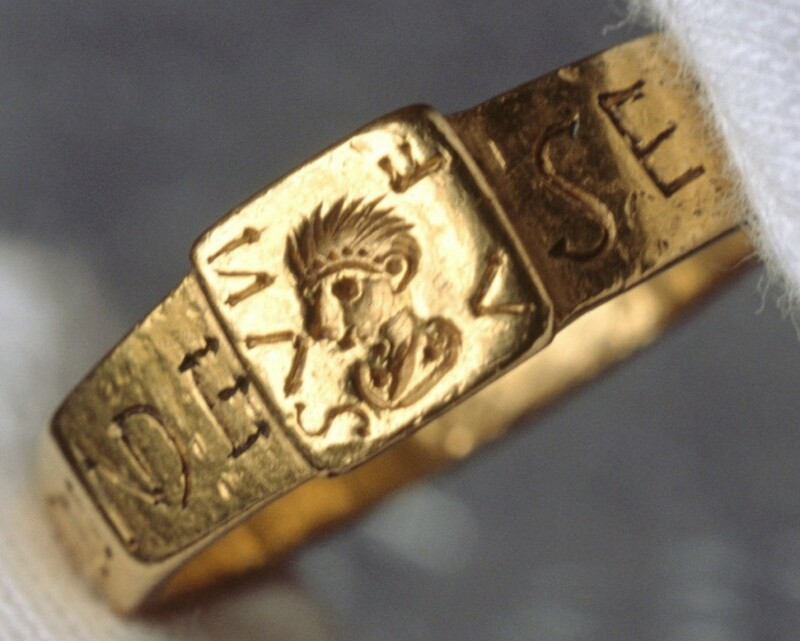 Senicianus apparently was not swayed to bring the ring back; instead, he was off engraving his name on it. It could be a coincidence, of course, but Senicianus is not a common name and that ring is not a common ring. Mortimer Wheeler knew of the ring, by then part of the collection at The Vyne, and its possible link to the curse tablet. We don’t know if he relayed this information to Tolkien, but it’s too juicy a speculation not to have been thoroughly indulged, including by the National Trust when they took over The Vyne. National Trust curators voted the gold ring their favorite artifact in a 2006 poll, but despite its link to the curse tablet (a copy of which is also on display at The Vyne) and its potential link to the author of the most famous books about a large gold ring ever written, it was in a small, easily missed display case in the library. This has now been remedied to take full advantage of Hobbit-mania. The ring will be the centerpiece of new exhibit, created in collaboration with the Tolkien Society, at The Vyne. 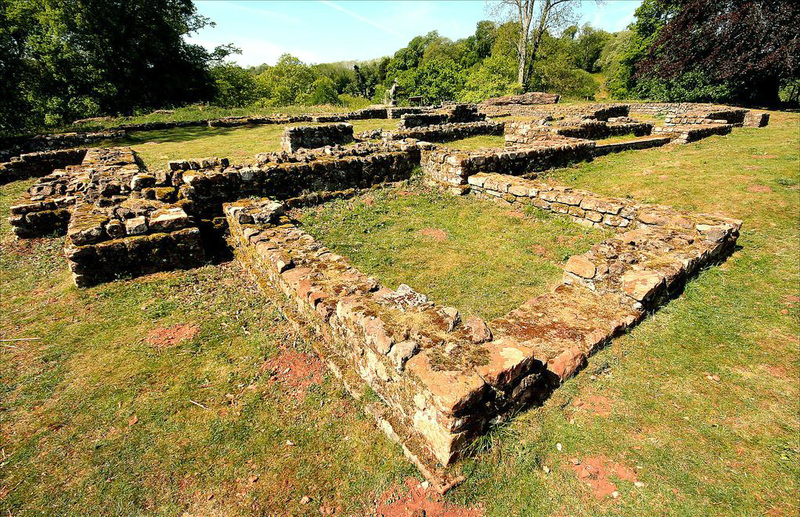 It tells the story of the ring, its possible connection to the Lydney Park curse tablet and Tolkien’s research. 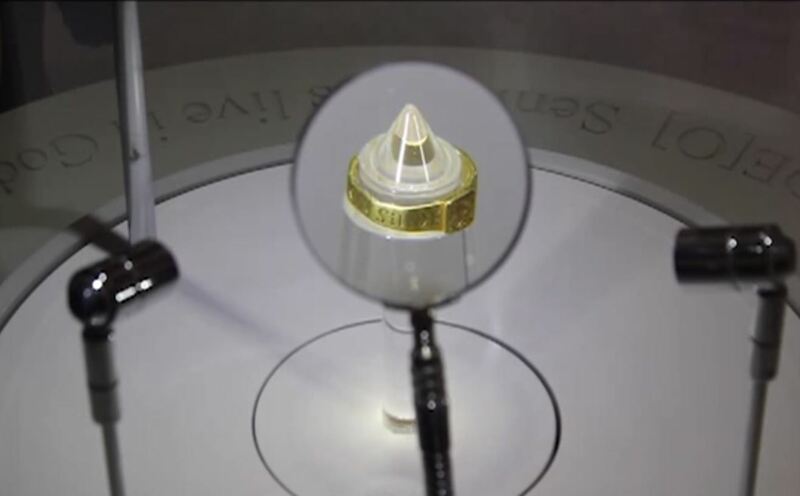 The new exhibit gives the ring a room of its own — the Ring Room in the former housekeeper’s office — and places it under spotlights on spinning pedestal that gives visitors a 360 degree view of the ring. A magnifying glass inside the case gives visitors a chance to read the inscription blown up as the ring rotates. It’s joined by a copy of the lead curse tablet (the original is in the museum at Lydney) and Tolkien-related objects like a signed first edition of The Hobbit. This entry was posted on Wednesday, April 3rd, 2013 at 7:19 AM	and is filed under Ancient, Modern(ish), Museums. You can follow any responses to this entry through the RSS 2.0 feed. You can skip to the end and leave a response. Pinging is currently not allowed. Looking at the ring… isn’t it more of a seal than just a ring? The “VENVS” is all reversed. Etymologically, “nudens” is, without any reasonable doubt, of either Etruscan or -according to some scholars- of proto-Elvish origin. Its meaning is in both cases remarkably close to “Drops his/her pants”. Moreover, I just wonder why Senicianus did not engrave something like “this PRECIOUS is a completely different one”. – Important: What were Silvianus’ plans for the other half of the ring, and was Nudens impressed by that leaden kind of IOU ? “Seniciane” is not a misspelling of Senicius, but is its vocative form. I don’t know why “in” is spelled with a double I. Perhaps it should be rendered, “Seniciane vivas. I in De[a].”, which means, “Senicianus, may you live. Go with the goddess.” Perhaps it’s an invocation, invoking Venus, asking that a curse be revoked.